Cholera is still rife in Haiti and far from under control. Having ravaged other parts of the island in June, it is now returning to the Haitian capital with a vengeance. According to figures from the Ministry of Public Health and Population, at the end of August over 446,000 people had been infected by the disease and approximately 6,300 people had died from it. 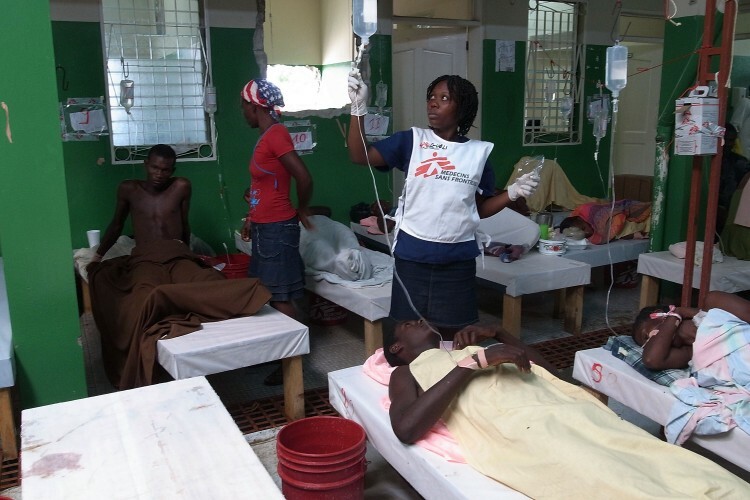 Since the first cases of cholera were confirmed in October 2010, MSF has treated almost 160,000 patients. Its teams have been deployed in nine out of the ten departments in Haiti. At present, the MSF teams are fighting cholera in Port-au-Prince as well as in the departments of Artibonite, Nord and Ouest. In its four cholera treatment centres (CTC) currently open in Port-au-Prince, the MSF teams have observed a significant increase in the number of patients admitted. “In the space of a month, we have gone from fewer than 300 admissions a week to more than 850, which unfortunately suggests that the situation will worsen in the weeks to come,” says Gaétan Drossart, Head of Mission in Haiti. One of the cholera treatment centres (CTC) in which MSF is working is in Martissant, one of the most deprived areas in the capital. Driving along the main road that leads to the CTC, it is impossible not to notice how vulnerable the population is. Between the piles of detritus, water from the leaking sewers is seeping into and flooding several roads. This creates an environment in which infectious diseases can spread very easily. “The hygiene conditions in the area are atrocious. It is extremely densely populated with very little in the way of functional sanitary infrastructure, which facilitates the spread of cholera, especially when people drink contaminated water and food,” explains Nicolas Charret, the on-site project coordinator. The CTC is attached to the emergency centre permanently managed by MSF. This is where MSF treat people infected by vibrio cholerae, the bacterium that has been spreading throughout Haiti for the last year. The centre has 90 beds and at present is treating more than 250 patients a week (its maximum capacity). Mathias Kennes, a nurse at the CTC, explains that, with cholera cases, it is essential to quickly determine the degree of dehydration suffered by the people admitted because this is the cause of most deaths. The treatment is then adapted according to the observed severity of the case. “If the person is severely dehydrated, they need to be treated straight away, either intravenously or through a nasogastric tube. With the correct treatment and intensive monitoring, patients, even those severely ill, usually recover in 3 or 4 days, he says. After three days of treatment, Amonly is hoping to go home soon. However, before he leaves, he explains that he is going to try and take more appropriate hygiene measures, including getting hold of chlorinated water. But he also says that it will not be easy to maintain these standards, given the lack of sanitary facilities in the area, which are shared by most of the residents. In Haiti, almost a year after the cholera outbreak, resources for adequately preventing the disease remain rudimentary and at the mercy of the uncertainties of life in the country.